The Docking Stick Boat Hook Adapter permits deployment of multiple lines in a matter of seconds. Functional in practically any docking situation, you'll feel confident about getting your lines on, in a safe, effective manner. Setting up your lines with the Docking Stick is as simple as tying a bowline knot to create the required loop size. (There is a sticker illustrating how on each Docking Stick, in case you are knot-challenged). The Docking Stick is then secured on the line by tightening the thumb screw. The thumbscrew should only be tightened enough so that the line in lightly pinched within the tube. This stops the line from sliding through. The loose end of the line is then passed through the cleat on the boat. The Docking Stick clip profile is designed to fasten on 7/8 to 1 1/4 diameter tubing, so it can be placed on a railing, pulpit or stanchion while you're waiting to come into the dock or mooring ball. Multiple lines can be set up ahead of time. When approaching the dock, simply take the docking stick, and clip it to your boat hook. Make sure the dock line is not tangled around your body, of any other parts of your boat. Extend the loaded boat hook, loop the line around the desired target, and give a little tug. The clip will release, leaving the line on the dock. Repeat for additional lines. Once your lines are deployed, pull the boat into the dock by reeling in the lines by hand, or using the boat's engine and the resulting tension on the lines to pull you into the dock. If desired, the Docking Stick can be removed from the line, and there will be enough line left to tie up to the dock in the usual fashion. For mooring balls, simply create a larger loop and pass over the mooring ball to catch it from underneath. 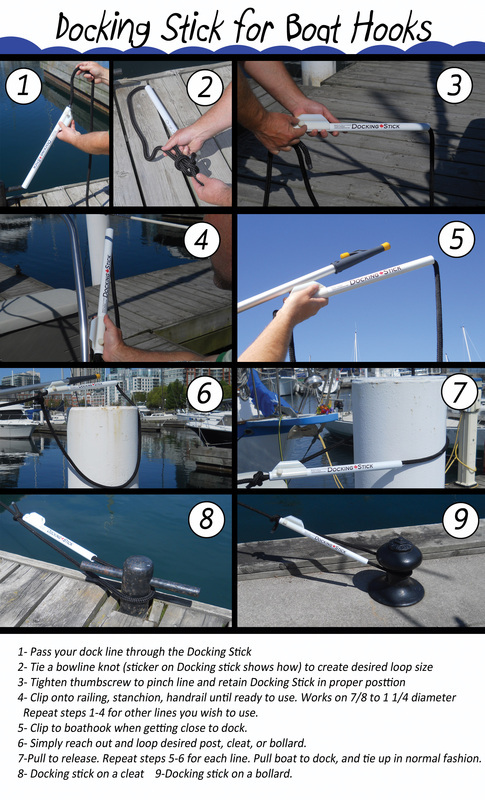 Only use DockingStick on a mooring ball as a temporary attachment to allow yourself the time to fasten a proper line on the ball, them remove the Dockingstick line. Docking Sticks are designed to clip together for easy and compact storage when not in use.